The F-35 Lightning II joint strike fighter program office announced today the European locations for heavy engine and heavy air frame maintenance, repair, overhaul and upgrade facilities. The Department of Defense has assigned F-35 Regional Maintenance, Repair, Overhaul and Upgrade (MRO&U) capability for airframes and engines for the European Region. The assignments were based on data compiled and analyzed by the F-35 Joint Program Office that was collected from European Partners and their industries. These initial MRO&U assignments will support near-term engine and airframe F-35 overseas operations and maintenance and will be reviewed and updated in approximately five years. As part of the F-35 global sustainment strategy, participating nations were provided with requirements outlining Regional MRO&U, or “heavy maintenance” needs for both F-35 engine and airframe. Each country was afforded the opportunity to work with their industrial base to provide the F-35 enterprise work over and above their own F-35 needs. Regional considerations such as forward basing, aircraft phasing, and transportation also contributed to initial assignment decisions. “In the European region, F-35 initial airframe MRO&U capability will be provided by Italy by 2018”. Air Force Lt. Gen. Christopher C. Bogdan, Program Executive Officer for the F-35 Lightning II Joint Program Office in Arlington, Virginia, said. 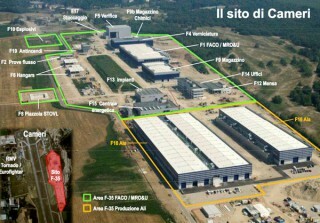 Italy has invested $1 billion into a purpose-built final assembly and check-out facility for the F-35, he said. “As Italy builds up their production capability at the FACO, there’s an opportunity later on to add more production capacity to that FACO if other partners and the U.S. want to build their planes there,” the general said. If the facility does shift toward production, Bogdan explained, the United Kingdom would be assigned to provide additional air frame depot capability. Should additional airframe MRO&U capability be required, the UK would be assigned to supplement the existing capability. Test cells for engine heavy maintenance are “very expensive — in the tens of millions of dollars,” the general said, and no single partner or their industry was willing to invest in more than one test cell in their nation. “That’s a big risk for industry and that partner long-term to get the return on that investment,” Bogdan said. Based on projections by the program office, at least three test cells were needed in order to build a sustainable program in Europe, he said. These maintenance assignments do not preclude the opportunity for other F-35 Partners and FMS customers, including those assigned initial airframe and engine capabilities, to participate and be assigned additional future sustainment work, to include component and system repairs, as the fleet grows and F-35 global presence expands.